Thanks to the continued support of our generous donors, the Belton Educational Foundation has awarded over $350,000 since the beginning of the Teacher Grant Program in 2008. 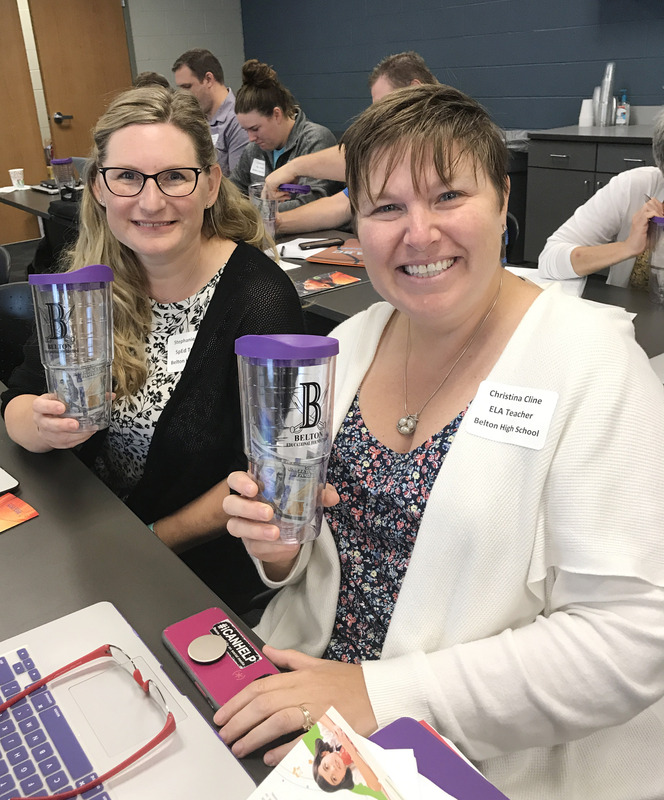 Each year, the Foundation encourages all teachers in the Belton School District to submit innovative ideas through this competitive grant request process. School District administrators review submissions and, if approved, are sent on to the Foundation for review and selection by a committee. 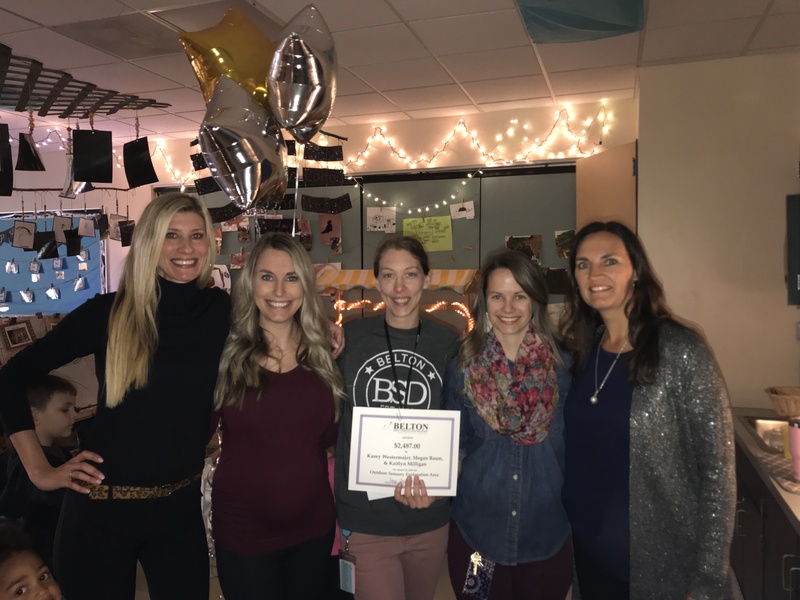 Hillcrest STEAM Academy teachers, Miranda Russell, Bridget Tapia, and Jackie Neilson were awarded $5,000 to create sensory paths both indoors and outdoors for all students at Hillcrest STEAM Academy to use. These sensory paths will guide students through a certain sequence of movements, that based on research, will stimulate their proprioceptive system and prepare their brains and bodies for learning. or earth science and spatial thinking concepts, among many other learning benefits. project and will include opportunities to design items for school fundraising projects. Classroom Re-design Project, to create a more adaptable and collaborative learning space with her students. Modifications will be planned by the students and will enhance hands-on learning activities as well as encourage more interactive discussion opportunities. TEAM Academy, received $2,499 for Logitech Crayons. Ms. Henry’s project will add Logitech Crayons as a new technology tool for students to use as they create, interact and learn with their iPads. The electronic crayons can be used with all curriculum, enhancing learning in all subject areas. Belton Middle School & Freshman Center teachers, Brian Meyer and Kelly Kramer, received $1960 for Hippotherapy (horse therapy) for Belton Middle School Life Skills students. Students will travel off campus to participate in interactive vaulting classes with horses. 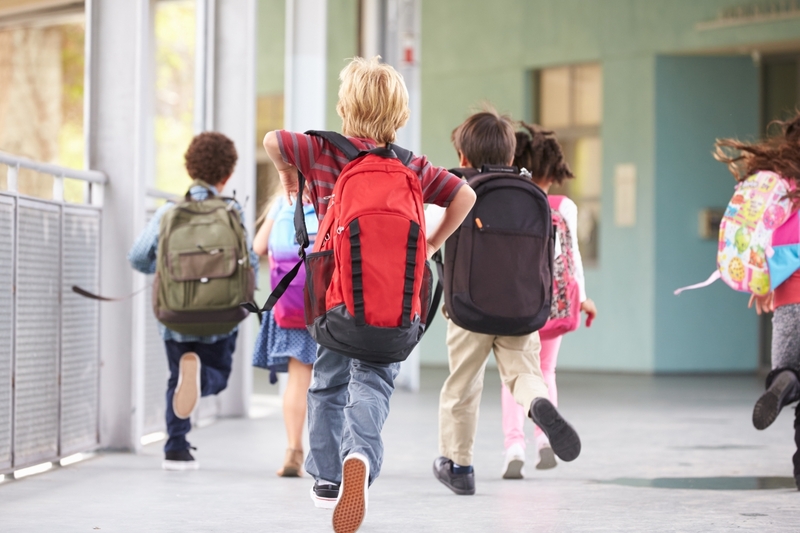 The classes will help students grow in areas such as social interaction, communication, problem solving, trust, balance, flexibility, and body awareness. Kim Carson-Swift, Music teacher at Scott Elementary, received $2000 for her project, Strum Up Some Fun with Ukuleles. Scott Elementary students will soon have the opportunity to experience music with ukuleles to enhance learning while in their music classes. Teachers, Kasey Westermajer, Megan Baum, and Kaitlyn Milligan, at Grace Early Childhood Center received $2487 to transform a new outdoor play area into an outdoor sensory exploration area. The new exploration area will include a sensory walking path, a rock and dirt area with digging tools, as well as a raised garden bed. Scott Elementary teacher, Samantha Grimes, received $1554 to purchase new, innovative handwriting tools that will support the development of fine motor skills in primary grade classes. Hillcrest STEAM Academy teachers, Sonja Abdelgawad and Lisa Albright, were awarded $4995.95 to create an outdoor classroom to be utilized by all students to enhance experiential learning in all curricular areas and student mental health. Amy Huff, Kentucky Trail Elementary second grade teacher, received $1,361.00 to fund a K-4 Math Conference and Resources to be used to increase student engagement and understanding of math concepts through the use of enrichment centers and fun Family Nights. Kaylin Blankenship, third grade teacher at Kentucky Trail Elementary received $1,170.00 to fund Blackboard Boogie Boards, a modern tool that replaces the traditional paper and pencil/whiteboards to enhance collaborative thinking and student engagement. Bethany Villaverde, Kentucky Trail Librarian, received $906.18 for Coding Robots and Board Games for school-wide use to increase math fluency. 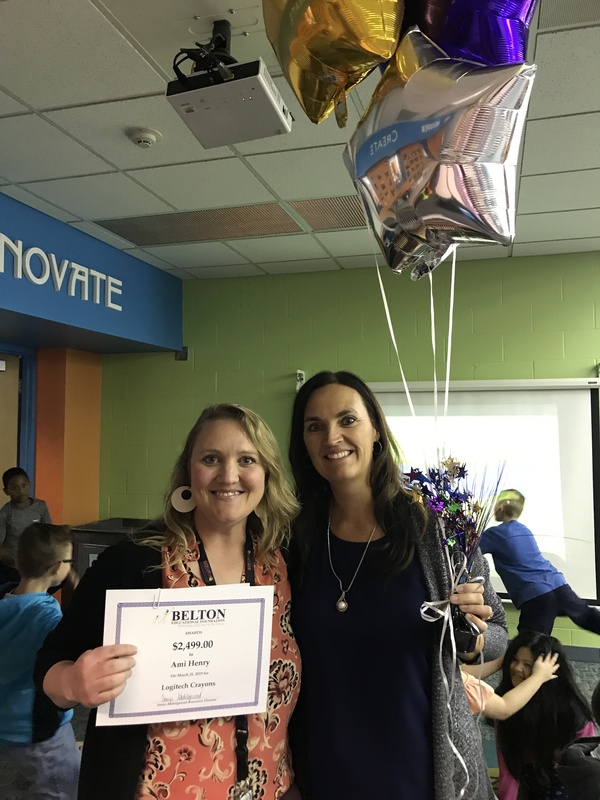 Madison Steffen, third grade teacher at Scott Elementary, was awarded $3295.00 to purchase the Reflex Math online math program that focuses on motivating and engaging students to improve math fluency. The program will be utilize school-wide at all grade levels. Gladden teachers Megan Watts and Deanna Crowe were awarded $3996.00 to implement a building-wide Collaborative Critical Thinking Library. Belton Middle School and Freshman Center teacher, John Jackson, received $1800.00 for the programming game, CodeCombat to be used in the Engineering & Computer Science class to move students from introductory programming to more advanced coding skills. Mill Creek Upper Elementary teacher, Shannon Newbold, was awarded $4950.00 to purchase Blackboard Boogie Boards for school-wide use. These devices are eco-friendly, and a more modern way to take notes and complete other tasks in a tablet-like format. Gladden Elementary music teacher, Justin Kohmetscher, received $480.00 to implement a Smart Music program into the 4th grade recorder unit. The real time playback and visual software is a more modern and innovative way to improve musical performance. Cambridge principal, Michelle Biondo, along with teachers Cherin McDonald and Amy Wright were awarded $4816.45 to implement a school-wide Coding for Literacy program to integrate 21st century skills into job preparedness through robots, board games and online resources to teach coding and literacy. Jane Scudder and DeAnna Wise, Hillcrest STEAM Academy teachers, received $1078.97 to purchase presentation equipment for students to create higher quality presentations. Amanda Crosby, Kentucky Trail Elementary kindergarten teacher, received $1775.50 for materials to implement block building STEM lessons and activities for Kindergarten students. This program helps to increase students engagement and increase early math and science knowledge. 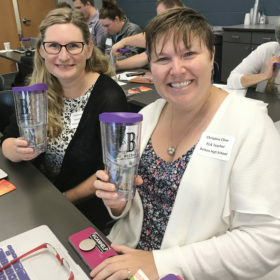 At the beginning of each school year the Belton Educational Foundation awards each new teacher to the district with a crisp $100 bill to help them get their classroom ready for school. Each year we set aside $5,000 to ensure this gift to all new teachers, helping to ensure a strong start for teachers and their students. 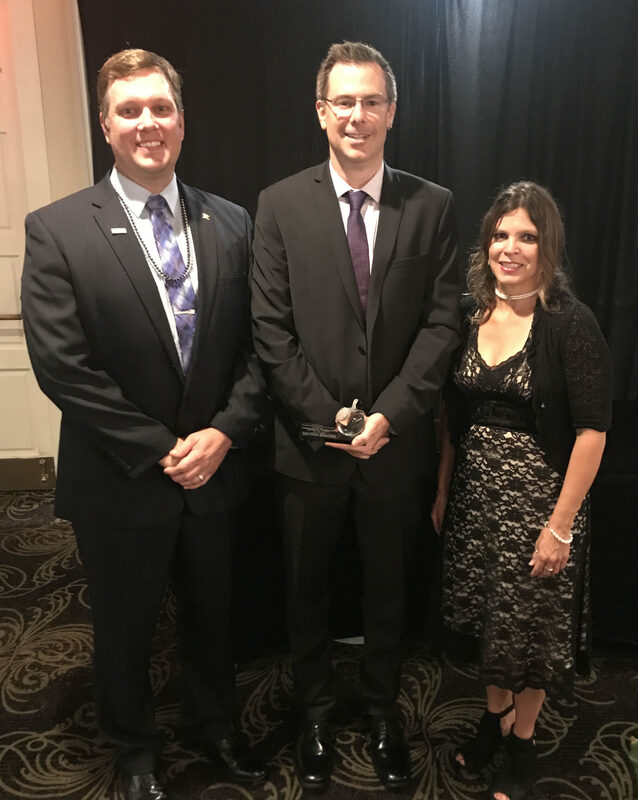 Beginning in 2011, the Belton Educational Foundation began offering an annual Excellence in Teaching Award to honor one teacher in the Belton School District who exemplifies excellence as determined by objective testing of his/her students. The award is now named the Jon S. Ferguson Excellence in Teaching Award and the recipient receives $2,500 for use in their classroom. Since 2010, the Belton Educational Foundation has secured over $1.3 million in grants from the Health Care Foundation of Greater Kansas City to fund the district ACCESS program (Appropriate Clinical Care Engaged in School Settings) and EARLY ACCESS at Grace Early Childhood Center. Through these programs, Belton School District partners with Pathways Community Health, who provides on-site licensed therapists in each of our school buildings to provide individual and family therapy to students who may not otherwise have access to them because of lack of insurance, transportation, income or other reasons. 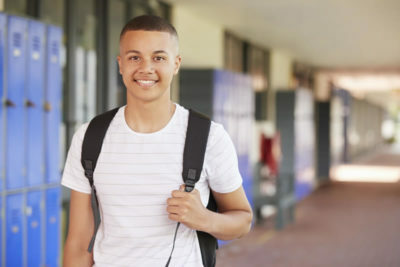 As a result of this initiative, we have seen a 40 to 50 percent decrease in the number of students placed in inpatient psychiatric care in the district, 90 percent of students receiving services during the 2015-2016 school year improved their ability to function as demonstrated by increasing scores on the Daily Living Assessment, and teachers report an improvement in the overall environment as students receiving services act out less in class, thereby decreasing the stress that exists for all students. We look forward to continuing our partnership with Pathways through the continued generous support of the Healthcare Foundation of Greater Kansas City. For more information about HFGKC’s initiatives, visit their website at https://hcfgkc.org/about/. Poor nutrition has a negative impact on our students. It keeps them from reaching their full potential and has lasting negative effects on their health. According to the Center for American Progress, children who do not receive proper nutrition suffer from a multitude of problems, including more frequent illness, higher hospitalization rates, iron deficiencies, lower physical functioning, and higher rates of mental illness. Children also remain one of the most vulnerable and under-served segments of our society, as they are unable to support themselves, are unqualified to work, and are reliant on the adults in their lives. By offering the BackSnack and Pirate Pantries programs in our schools, we will be eliminating barriers to nutrition such as transportation and finances while increasing access to the most basic preventive health care available, nutritional food, for our most vulnerable population. It is thanks to our generous donors that these programs continue to provide much needed support for our students. 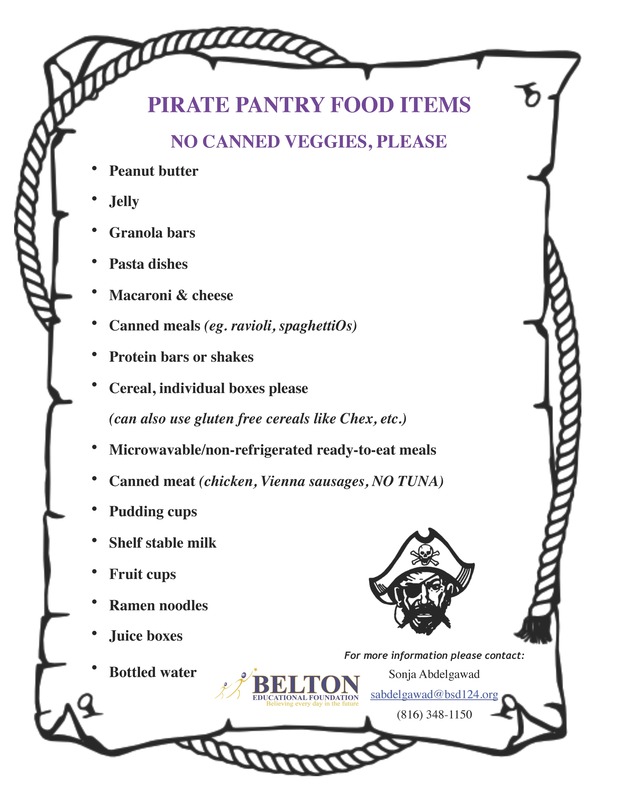 Monetary donations are welcome for both the BackSnack and Pirate Pantry programs. We also accept food donations all year round for the Pantries. At this time, we are not accepting any canned vegetables or any food that is past its expiration date. If you or your organization is interested in arranging a food drive, please contact Executive Director, Sonja Abdelgawad at 816-348-1151 or email sabdelgawad@bsd124.org. Each Spring, the Belton Educational Foundation awards scholarships to graduating college-bound seniors. Thanks to continued support from our generous donors, we awarded over $15,000 to 22 students through our three scholarships:The Current and Past Employee Scholarship, the Belton Educational Foundation Scholarship, and the Sandy Hamilton Scholarship. Scholarships are available to any Belton high School Senior with plans for continued education. 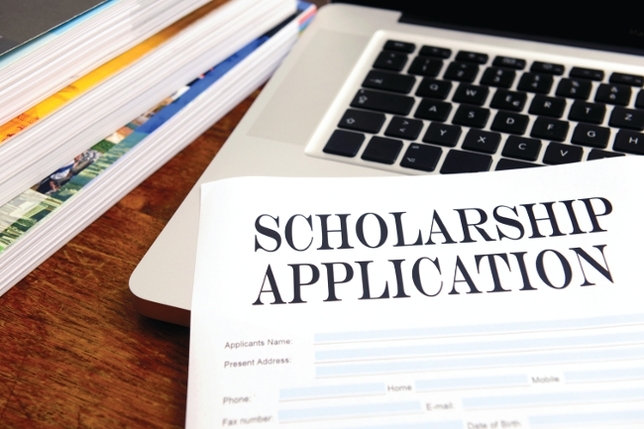 Scholarship applications for 2019 are now available. “Thank you for applying to the [Name of Scholarship]! Your response has been recorded”. For questions, contact the Foundation Executive Director via email at sabdelgawad@bsd124.org or call 816-348-1150.